For Every One Human Alive There Are One Millions Zombies. What Would You Do? What I have tried to do with this FanEdit is to create a film more in keeping with the three previous Romero Dead Films. I have removed money as a motivator and reduced the Zombies reasoning. I have also removed the more obvious special make-up effects and increased the level of gore and carnage. I have also trimmed the more formulaic dialogue and attempts at light humor. There is a new prologue, whole new sequences and a new ending. I will let you judge if this works or not. Thank You to Tranzor and boon for your support and help with this project. New: Sounds of sickening carnage have been added. New: Many Music cues have been added. New: Numerous Sound Effects and Ambience have been added. Many other cuts and changes have been made that are not listed. 1. New: Prologue: To establish the state of the world. 2. New: Opening Scene. 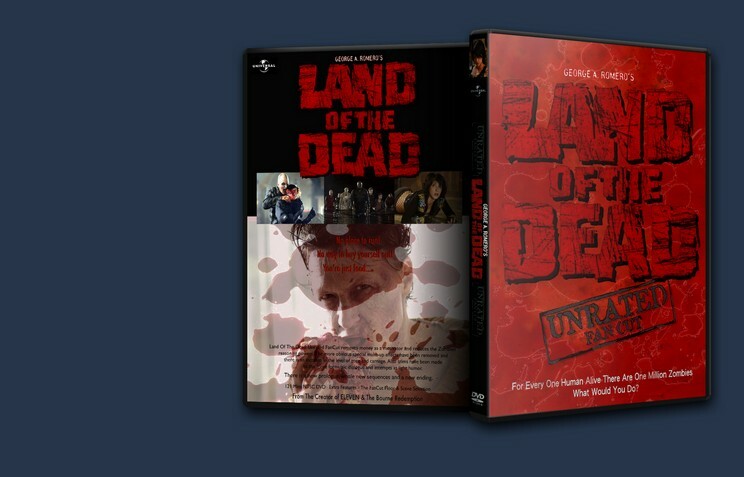 Re-positioned & Re-cut with New Land Of The Dead Title. 3. Cut: Original Beginning with Dialogue concerning the Zombies evolving or learning outside Gas Station. 4. New: Scavengers or Raiders. 5. Cut: Zombie woman puppet. 6. Cut: Introduction of Charlie and most of his incessant whining through out this FanCut. 7. Cut: Parts of the opening confrontation between Cholo and Riley. 8. Cut: Concentration on Big Daddy (Hero Zombie), his motivation of the Zombies and his communication with other Zombies. 9. Cut: Big Daddy stamping on the Zombie severed head. 10. Cut: The conscious decision by Big Daddy to lead the Zombies and follow Dead Reckoning. Now it’s more instinctive. 12. Cut: Some of the forced confrontation between the Riley and Cholo after the scavenge. 13. Cut: All references to money as a motivating factor have been removed. 14. New: More establishing shots of the human ghetto outside the Fiddler’s Green Tower. 15. Cut: Riley’s numerous good deeds in the Ghetto. 16. Cut: Riley and Revolutionary scene. Also more of Riley’s good deeds. 17. Cut: Revolutionaries ill son. 18. Cut: Big Daddy’s more obvious reactions to seeing the hanging Zombies that were used as target practice. 19. Cut: All of the Cholo’s telephone calls concerning a pay-off. 20. Cut: The skateboarder kid scenes. 21. New: Added more carnage to Zombie attack of compound. 22. Cut: Scene with Kaufman (Dennis Hopper) in the boardroom talking of leaving Fiddler’s Green. 23. Cut. Big Daddy jumping into the river. 24 Cut. Big Daddy inciting the use of tools on reaching the city limits. 25. Cut: Big Daddy showing a woman Zombie how to use an automatic rifle. 26. Cut: Some of Zombie’s picking up tools. 27. Cut: Big Daddy reasoning that the nematic drill can be used at the Fiddler’s Green Tower. 28. Cut. Kaufman packing money in a vault area. 29. Cut: Kaufman exiting the lift and shooting an executive. 32. Cut: Shots of Riley on the window of Dead Reckoning and Slack’s light-hearted reactions. 33. Cut: Certain moments so it is less obvious that all the Zombies entering the Mall are using of tools. 34. New: Extension of the carnage in the mall. 35. Cut: Kaufman escaping and shooting at Big Daddy. 36. New: Shots of Kaufman being bitten on the neck by the Cholo Zombie. 37. Cut. Big Daddy blowing up the car and killing Kaufman and Cholo. 38. New: Dead Reckoning firing Rockets at underpass. 39. New: Big explosion under the over-pass and Zombies being blown to bits. 41. Cut: Revolutionaries and Survivors emerging. 43. New: More serious expressions from the cast as if all inside Fiddler’s Green have become the undead. 44. New: End Credit Sequence and Music. 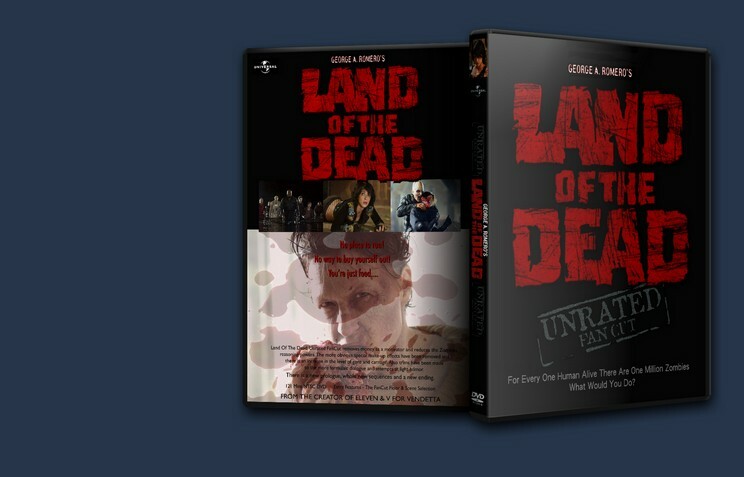 I always liked Land of the Dead, but I'm glad for Mollo's alternate edition. The movie feels more to the point and I enjoyed seeing it without the sentient Zombie plotline. The quality varies in the segments with added footage, especially in the new prologue. I loved the way that opening was put together but I couldn't help but notice how different every shot looked. Otherwise the editing was great throughout. If you're a Romero fan, I recommend this edit. I rated this movie 8 out of 10 because the source material is just not good enough to warrant better. Now as for the skill of the editor i found no mistakes or problems 10 out of 10 on that front. Also did he polish the hell out of this turd? yes he did this movie is better than the original by miles. 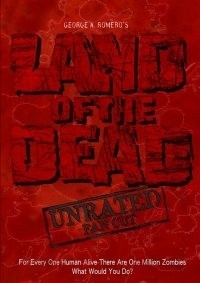 So i endorse seeing this movie if you never saw the original or if you love zombie movies and hated the original. But if you didnt like the original and you are indifferent about zombie movies then skip it, its way better than the original but its not must see viewing. Well, I can’t add anymore to what’s already been said.